A typo in the build script of AOSP-based custom ROMs for the Google Pixel and Pixel XL smartphones is reportedly causing the photo uploads from Google Camera to count against the Google Photos storage limit. The bug, however, is fixed now and users running custom ROMs on first gen Pixel phones should be able to use the unlimited Google Photos storage as usual. 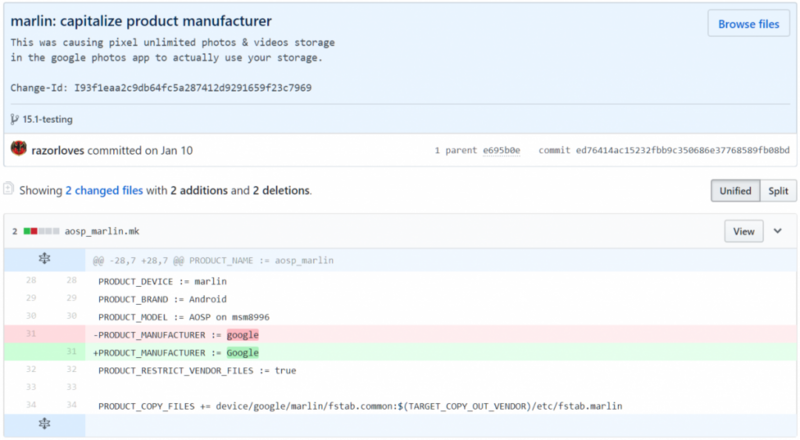 A typo error in the build scripts for Google Pixel and Pixel XL custom ROMs resulted in photos uploaded to Google Photos being counted against the storage limit. The Pixel smartphones have been bestowed with unlimited Google Photos storage, which enables users to upload high quality original photos taken by the Google Camera app without counting against the storage limit. This typo error in question was because the flag "PRODUCT_MANUFACTURER" was set to "google" instead of "Google" resulting in the consumption of storage on Google Photos. Only the first generation Pixels running on AOSP-based ROMs are being reportedly affected by this bug. Those running on stock ROMs and the Pixel 2 phones running AOSP-based ROMs seem to be okay. The error, however, has been identified and fixed by XDA Senior Member 'razorloves'. A fix for this was submitted to AOSP on July 3 and merged on July 6. Therefore, downloading newer custom ROM builds from XDA should be just fine. Did you flash a custom ROM on your Pixel and happened to run into this bug? Let us know below.